How much is Takanori Gomi Worth? Takanori Gomi net worth: Takanori Gomi is a Japanese professional mixed martial artist who has a net worth of $3 million. 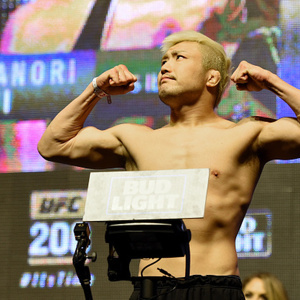 Takanori Gomi was born in Kanagawa, Japan in September 1978. He has competed as a featherweight, lightweight, and welterweight. Gomi made his MMA debut in the Shooto promotion by defeating Hiroshi Tsuruya in November 1998. In December 2001 he defeated Rumina Sato to win the Shooto World Lightweight Championship. Gomi lost the title in August 2003 to Joachim Hansen. He competed in Pride Bushido where he had the fastest knockout in Pride FC history in six seconds over Ralph Gracie in May 2004. In December 2005 he won the Pride Lightweight Championship by beating Hayato Sakurai. Gomi made his UFC debut and lost to Kenny Florian in March 2010. In August 2010 he defeated Tyson Griffin and had the Knockout of the Night. He had Fights of the Night in wins over Mac Danzig in November 2012 and Isaac Vallie-Flagg in April 2014. As of September 2017 his record was 35-14 with 13 knockouts.